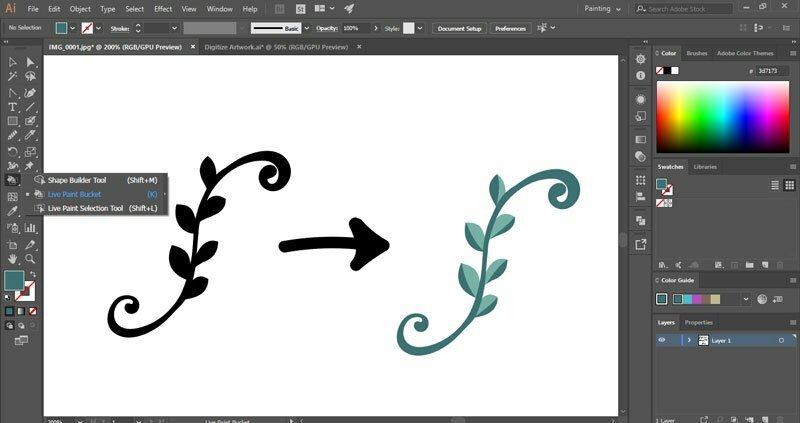 In this tutorial, I’m going to show you how to digitize a sketch using Illustrator. We are also going to talk about the best methods of drawing, capturing the image, digitizing, and coloring your illustrations. 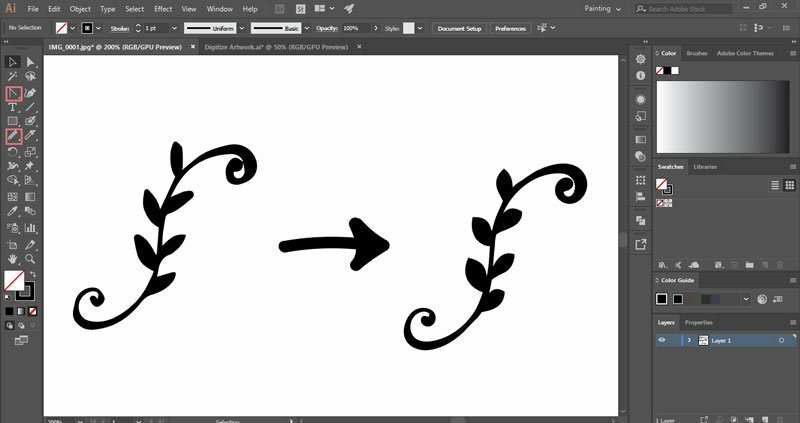 You can use this method to vectorize your hand-drawn sketches or you can use it for hand lettering. 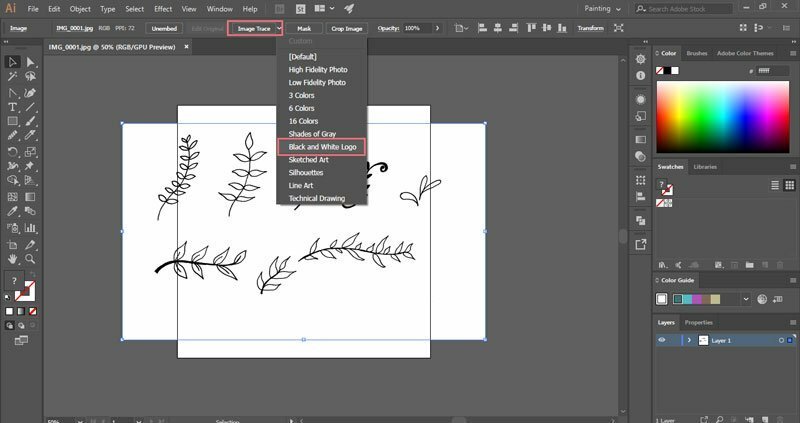 When you are done, you will be able to resize your drawings, edit them, and add them to products. 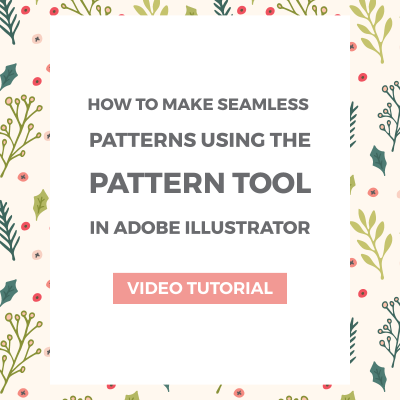 Before we get started, let’s take a look at the best methods for creating your drawings. You will need pencils, black ink pens or markers, and paper. For the best results, it’s important to have contrast in your sketches, so you should use black ink on white paper. If you like to draw using pencils, make sure you trace over the drawing with an ink pen or marker and then use an eraser to delete the pencil marks. 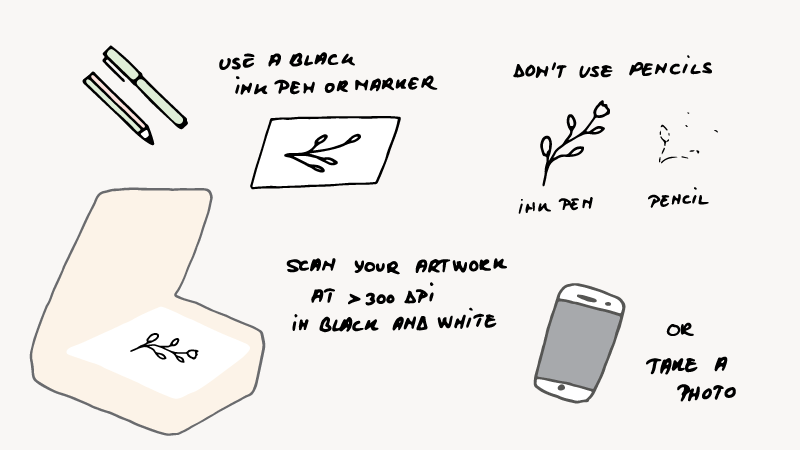 If you use pencils or lighter ink pens, your scanner and Illustrator might not detect all the details in your drawings and you will be left with bits and pieces of your drawing. The next step is to turn your illustrations into digital images. I recommend using a scanner that’s set at 300 dpi or more, in black and white color mode. 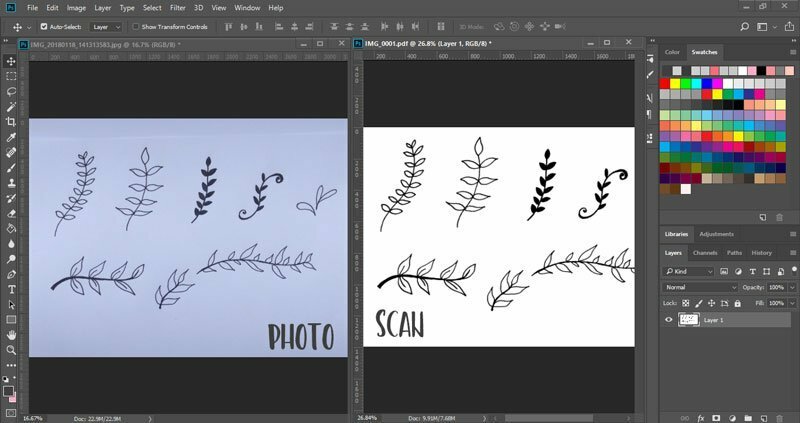 Scanned images are usually clean and you can open them in Illustrator. If you have dark areas, you might need to make some changes to your image. If you don’t have a scanner, you can use your phone or camera to take photos. Make sure you have good lighting and there are no shadows. Take a few photos from the same height until you find the best one. Open your image in Photoshop. We are going to clean it and then export it to Illustrator. 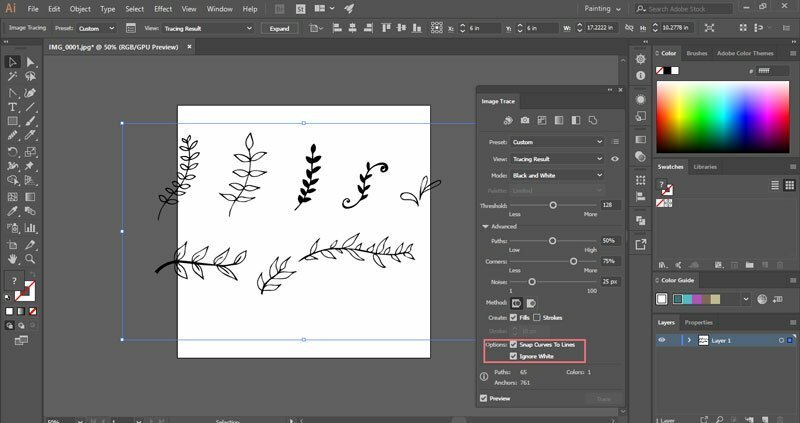 Use the Crop tool (C) to remove everything that’s outside your drawing. You can also remove areas that are darker or have shadows. The next step is to turn your image to black and white. My photo has a blueish tone and this small adjustment will remove the color. Just go to Image > Adjustments > Black and White. Now we are going to go to Image > Adjustments > Levels (Ctrl + L). Select the eyedropper that’s on the right side of the Levels menu and click on the paper. This will whiten the image. Next, select the eyedropper on the left to sample the black. After that, use the sliders to increase the level of white and black until you have a white background and black illustrations. 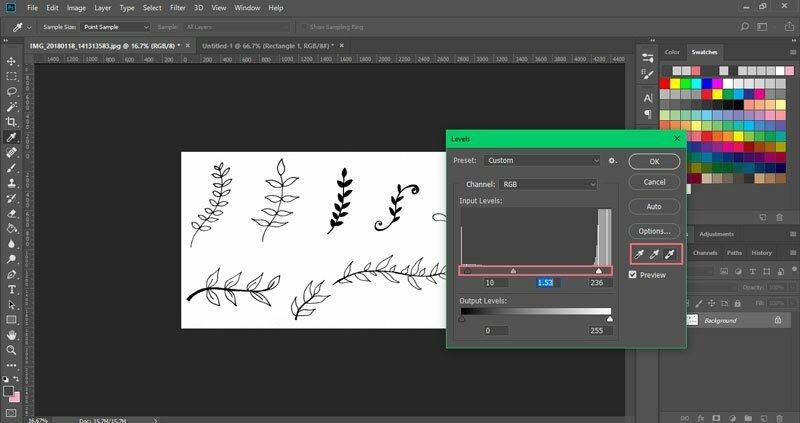 You can also go to Image > Adjustments > Brightness/Contrast and increase the Contrast to make the lines darker or the Brightness to make the background white. 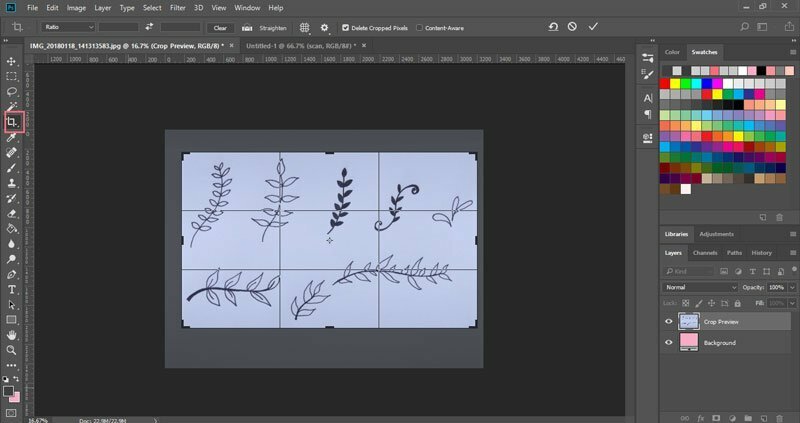 Use the Rectangular Marquee tool (M) to select the image and go to Edit > Copy Merged and copy the image, then paste it into Adobe Illustrator. You can also export your image as a JPEG and place it in Illustrator. We are going to use the Image Trace tool to automatically vectorize your drawing. 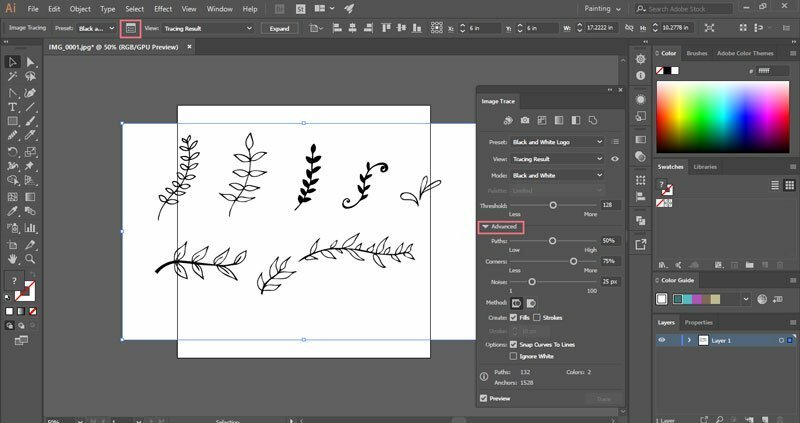 When you place a raster image in Illustrator, a toolbar will appear at top of your artboard. On that toolbar, you can find the Image Trace option. Click on the arrow that’s right next to Image Trace to open the presets. Choose Black and White Logo from the drop-down menu. 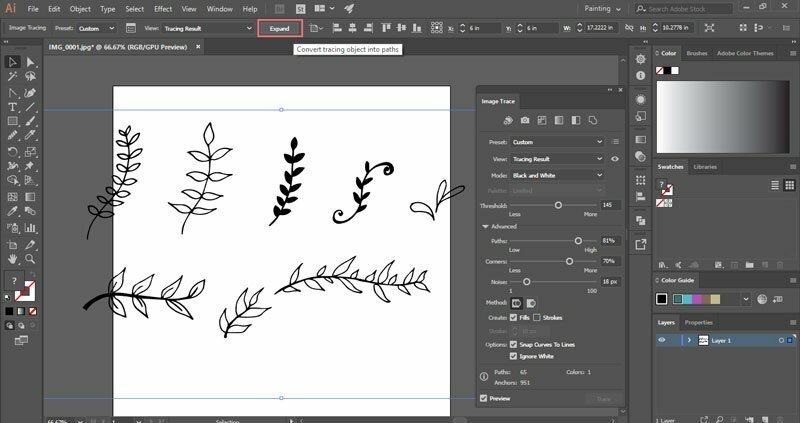 This option will trace the drawings and turn them into vectors, but you can still make a few changes to them using the Image Trace panel. To open it, click on the icon that’s on the horizontal toolbar or go to Window > Image Trace. First, we will remove the white background. Go to Advanced and click on the arrow next to it. Find the Ignore White box that’s under Options and enable it. Threshold: the Image Trace tool vectorizes the drawing based on the black and white pixels. The threshold specifies which pixels will be turned to white and which pixels will be black. All pixels lighter than the value will be white, and the darker pixels will be black. If you have a large threshold, the lines will be thicker. Paths: this option will allow you to specify how close the resulting path will be to the original sketch. If you have a looser path, the lines will be smoother, but you will lose some of the details of your original illustrations. Corners: specifies the number of corners. If you have a higher value, you will have more corner points in your vectors. Noise: controls the number of pixels per area. Regions with fewer pixels than the noise level will be ignored. If you have a low noise level, you might lose small dots or thin lines. Once all the settings are the way you want them, click on Expand to turn your drawings into vectors. These vectors usually have small imperfections. I love that hand-drawn look, so I don’t use the Pen tool or the Brush to trace over the vectors, but I do make small edits to them. This is a very slow process. It takes a lot of time and you might not get the best results the first time you try it. I use the Smooth tool to go over each path. Like its name says, this tool makes the lines smoother and removes sharp corners. If I still see areas that I don’t like, I use the Anchor Point tool and the Direct Selection tool to move anchor points and change curves. If you want to recolor your artwork, you can use the Selection tool or the Direct Selection tool to add color to your graphics. Another tool I love to use is the Live Paint Bucket tool. This tool will allow you to color the outline of your drawing and the area that’s inside the paths, even if it doesn’t have a fill color. Just select your artwork, select the Live Paint Bucket tool, choose a color, and click on the area you want to paint. 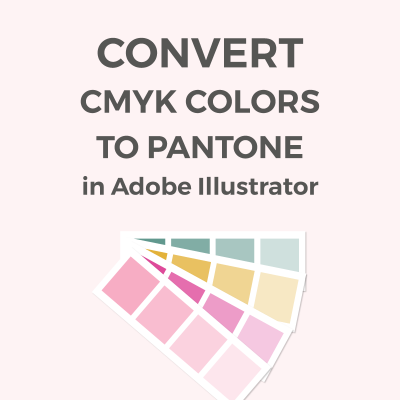 Once you finish painting your illustrations, select your artwork and go to Object > Expand. The Live Paint Bucket tool works like an effect and you will need to expand your vector before you can use it in another design. 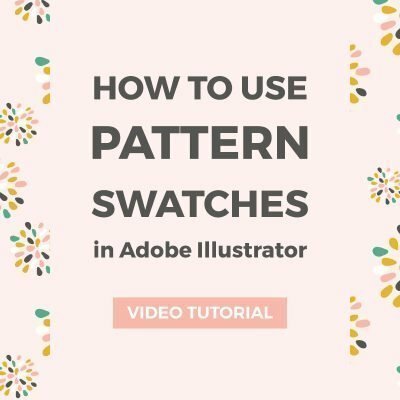 Hope this tutorial was easy to follow and it will help you create beautiful patterns and illustrations. 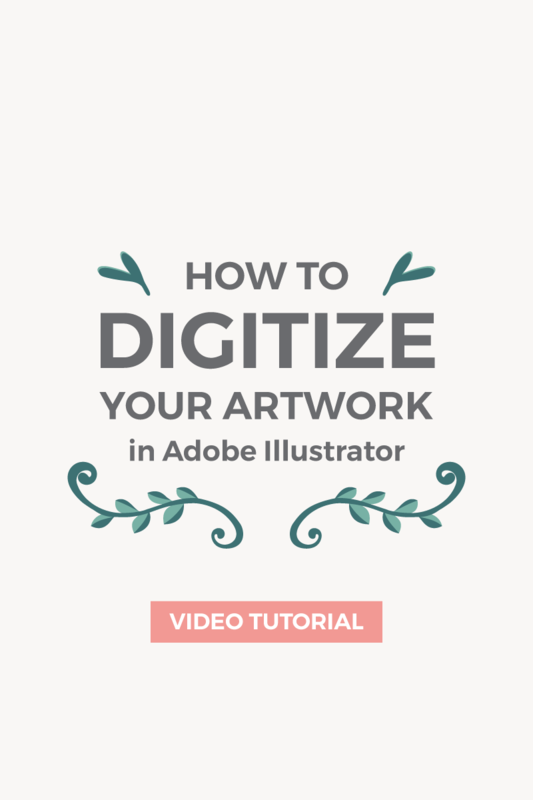 Do you digitize your drawings in Illustrator? 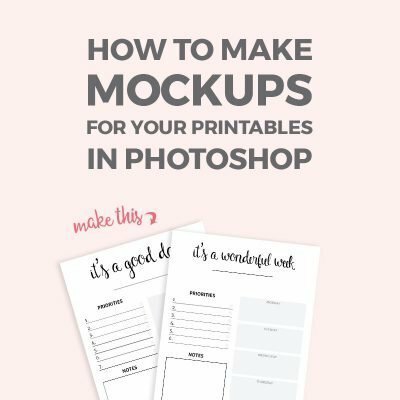 Or do you like to use Photoshop? Thank you so much for this tutorial! This was my first time using Photoshop and illustrator. I was not finding any videos at all on how to get rid of the color on the picture I drew, and how to make my pen marks so much more defined. How amazing!